To document my knitting but now also motherhood and life's adventures! This was actually finished last week but it's taken me a week to get round to seeing the buttons on! But how cute are those penguin buttons?! I love them! I actually really love the whole cardigan, love the colour and loved knitting it. This will definitely be on my list to do again! I opted for short sleeves as baby is due end of June so hopefully it will be warm enough for short sleeves. There will of course be another photo with baby in the cardigan and I may have to make the bigger version too! Well that's it for me, I'm on holiday this week, so hoping to get lots of knitting done and I have a few blog posts I've been working on that I hope to get posted. Oh those buttons just perfect the sweater. Very sweet! Who can resist a cute baby card, and such a lovely choice of colour too, I always wonder why most people dress babies so blandly. One of my fave baby knits! Love those buttons. I knitted one of these in a bright orange but have neglected it as Far as buttons are concerned because I've not found the perfect ones! Thanks for reminding me, I think finding the right buttons will be on th to do list today. Thanks for sharing. Completely charming, and you're right, the buttons are the perfect finishing touch. i love that knit. i've made it a few times. :) great color and perfect buttons! 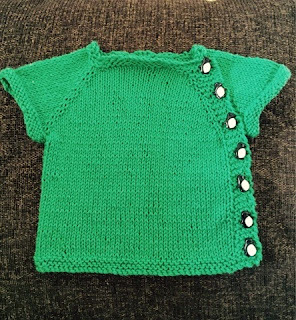 Such a gorgeous little cardigan and in a beautiful green! I wondered that my toddler would grow out of the jumper I was making before I completed it too. That is a darling sweater, especially for those of us who love buttons! Very sweet buttons. I made so many of that little sweater a couple years ago. Enjoy! Hi, I’m a mum to 2 wee boys and we have another on the way! Using this blog to document our little adventures as a family.